Easy to carry - less than 47 lbs!! Power for microwave, refrigerators, hair dryer, small AC units, and much more: This popular model can operate a wide variety of appliances, making it perfect for portable use at home, camping, on the jobsite, or much more. Take a look at the applications tab for more examples. Super quiet - less noise than normal conversation: So quiet, your neighbors will thank you. The EU2000i operates at 53 to 59 dBA, which is less noise than a normal conversation. This makes it ideal for camping, supplemental RV power and any other activity that requires quiet operation. 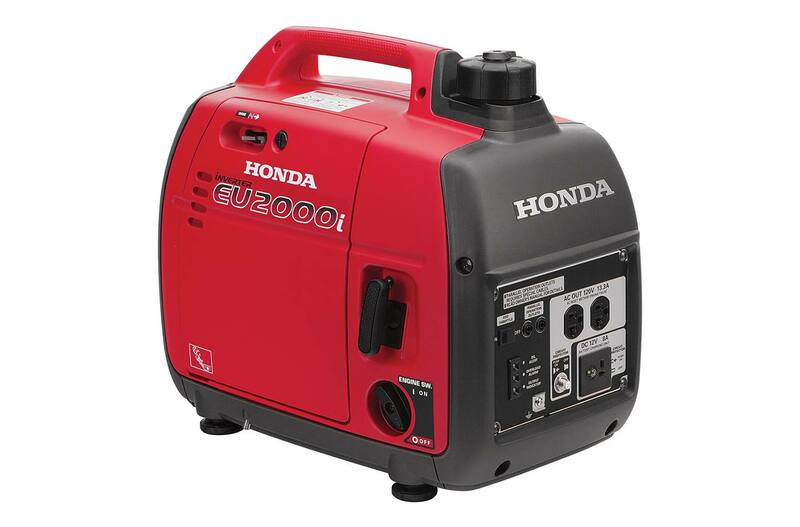 Lightweight and compact: Weighing less than 47 pounds, the EU2000 is incredibly lightweight and portable, thanks to Honda's inverter technology. Fuel efficient - runs up to 9.6 hrs on less than a gallon of fuel: Thanks to our exclusive Eco-Throttle System, the EU2000i offers great fuel efficiency. Runs 4.0 to 9.6 hours on a single tank, depending on the load. This makes it great for overnight power. Double your power with parallel capability: Need more power? Add a second EU2000i for additional power. Two identical models can be paralleled with an optional cable or cord for up to 4000 watts of power. Fuel Tank Capacity: .95 gal. Dimensions (L x W x H): 20.1 in. x 11.4 in. x 16.7 in.